A Venturer who has achieved the First Class rank in a troop may continue working toward the Eagle Scout rank as a Venturer until their 18th birthday. There is no alternate Venturing advancement route to qualify for the Eagle Scout rank. The Venturer may fulfill leadership requirements by serving as president, vice-president, secretary, or treasurer of his crew. The Scoutmaster conference will be conducted by the crew advisor. As a Venturer meets the requirements for Star and Life ranks, a board of review is conducted by the crew committee. The Eagle Scout board of review follows the procedure established by the district advancement committee. Venturing Award: The first step in any journey is the courage to begin. At this level, the new crew member makes their commitment to join and move forward into the experience of Venturing. Discovery Award: The adventure of participating with the crew unfolds, and each Venturer begins to discover his or her interests and talents. As the Discovery Award recipients develop new skills and competencies, their eyes are opened and the world expands for them. Pathfinder Award: The Venturer’s capabilities and skills expand, and with them come increased responsibility for defining their own way forward in life, service to others and formal planning and leadership of the crew toward its goals. 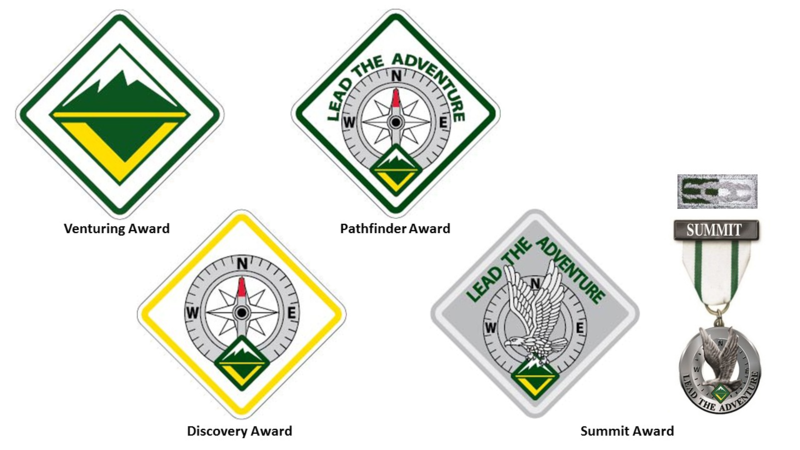 Summit Award: The highest award of Venturing, the Summit Award, goes to those Venturers who have matured in their personal direction, skills, and life competencies, and who have accepted the responsibility to mentor others and serve their communities in a lasting way. For additional information, contact the district advancement chair or the council Venturing leadership.